Facts from the pro-slaughter brigade are easily disputed, especially when it states slaughter is saving "unwanted horses" from neglect or abuse. The trade is really about supply and demand. As a horse owner, I have been involved in the fight to end horse slaughter in the United States since 2003. This task should be easy considering that Americans hold the horse in high regard, but believe me when I say this has been one of the biggest challenges I have ever faced. The American Horse Slaughter Prevention Act (AHSPA) has been pending in Congress for several years now but certain politicians, and groups claiming to know what is best for horses, stand in our way. Those groups are the American Veterinary Medical Association (AVMA), the American Quarter Horse Association (AQHA) and certain agricultural interests (mainly beef and pork producers); the politicians include Rep. Bob Goodlatte (R-VA), former Rep. Charles Stenholm (D-TX), and Senator Larry Craig (R-ID). But the arguments used by these groups and individuals are not based on fact. Every statement they make is easily disputed. A woman named Mary Nash once told me that the best way to fight the pro-slaughter side's myths is with facts which can not be disputed. Unfortunately, Mary lost her battle with cancer in July of 2005. Over the years, I have come to know the following facts about the horse slaughter trade. The horse slaughter trade is really about supply and demand, not saving "unwanted horses" from neglect or abuse. The ban on horse slaughter is not a "vegetarian agenda" to ban the processing of beef, pork, chicken or other meat which is culturally accepted here in the US. 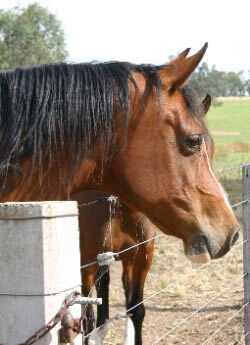 In the United States, horses are not regulated as food animals. The horse slaughter industry is neither good for the local or national economy. When confronted with facts the pro-slaughter side either repeats their claims or attempts to deceive the public. The horse is a strong part of American culture. A few years ago, I read a White Paper commissioned by the Thoroughbred Retirement Foundation called "Horse Slaughter: An Unnecessary Evil." The title of that paper pretty much sums it up since horse slaughter is completely unnecessary in the United States. The favored argument of the AVMA and AQHA is that if horse slaughter is banned horse welfare will suffer in the form of abandoned horses and horse neglect, but they fail to take into consideration USDA statistics which show that their dire claims have not happened in the past. Instead, these statistics show a business driven by supply and demand rather than unwanted horses. The statistics that I mention come from the USDA;, they show that there was a sharp decline in the number of US horses slaughtered during the 1990s. According to these records there were 345,700 horses slaughtered for export in 1990; 10 years later in 2000 that number was 50,400. During this timeframe the number of horses slaughtered per year dropped by as many as 79,000. Interestingly, there was no evidence of a rash of "unwanted horses." We did not see newspaper articles telling tales of starving abandoned horses. Fast forward to now. Since 2002, there has been a steady increase in the number of horses slaughtered in the United States. In 2007, well over 120,000 American horses have been slaughtered for export to Belgium, France and other countries where horse meat is popular. This is due to increased demand, as evidenced by this excerpt from the article "France's horsemeat lovers fear US ban" which appeared in The Guardian on June 15, 2007. "In France, the news has caused concern. 'It's serious, the US is a big part of our supply,' says Timothé Masson from Interbev Equins, an organisation of French horsemeat industries. Sales of horsemeat in France rose by 2.1% in 2005-2006, the first upturn in years. Tastings, supermarket campaigns and marketing drives have increased consumption of what was once a cheap, working-class food in Paris and the mining areas of north-east France. Although only a handful of restaurants still serve horse in the French capital, Masson's group is working to convince more chefs. It is also targeting the public with monthly recipe suggestions, such as sliced horse with tabbouleh." Masson is also on record as saying that the estimated increase for 2007 is 3% and that official 2007 statistics for the French horsemeat industry will be released in mid-2008. Through clever marketing, people like Masson are creating increased demand. How can there be an "unwanted horse problem" if the slaughterhouses have to import them from across the border? I would really like to see the AQHA and AVMA answer this question. Statistics do not lie. They show that the horse slaughter industry exists in the US for one reason, to make a large profit satisfying Europe's voracious appetite for American horsemeat. It has nothing to do with saving "unwanted horses" from neglect. In an August 2006 alert, the Livestock Marketing Association (LMA) said this about the AHSPA: "This bill may be only the first in a series of bills pushing the animal rights agenda restricting the consumption of meat and the private property rights of livestock producers. Banning a legitimate livestock product for reasons other than food safety or public health is a very slippery slope that the Congress must not be allowed to go down." This claim itself is absurd and only truly weak minds would believe it; a majority of the House of Representatives obviously did not since they passed the AHSPA by a landslide in 2006. But we do have those few in the Congress who support this agenda, and they have managed to block the bill in the Senate (which means it's not law yet). It's easy to see the fallacy of the LMA's claims if one also considers that the horsemeat trade is illegal in three states in the Union. In 1998 California passed a law which banned the horse meat trade by voter referendum. Last year a similar law was signed into law in Illinois and the horse meat ban was upheld by the Texas legislature. Despite these laws protecting horses people in those states can still go down to the local butcher and buy hamburger, tri tip, pork sausage and chicken. Polls show that a majority of Americans are against horse slaughter because it's not part of our culture, however many of us do eat beef, pork and chicken since those foods are part of America's cultural norm. I myself know a farmer in Virginia who is against horse slaughter, but he raises Boer meat goats for slaughter as well as raising beef cattle. Reality shows that the slippery slope claims of the agricultural world will not happen. Here's a small sampling of the agricultural groups who are against the AHSPA: The National Cattlemen's Beef Association, the American Meat Institute, the National Pork Producers Council and the National Turkey Federation. Now I'm sure that these groups do beef, pork and poultry well; but they have nothing to do with horses. Rather than worrying about the AHSPA, they would better serve our nation by seeing to our nation's food supply. Something that the AVMA and the horse slaughter business have never addressed is the fact that horses are not regulated as food animals in the United States. Practically every horse owner routinely treats their horse with products such as Zimectrin (a dewormer), Phenylbutazone (the aspirin of the horse world) and fly sprays; these products are clearly labeled "Not For Use On Animals Raised For Food." Meat tainted with these products can cause nasty long-term side effects in human consumers such as cancer, which is why federal regulations forbid they be administered to beef cattle, poultry or hogs. Since no such regulations or safeguards exist to prevent these products being given to slaughterbound horses it's likely that tainted horsemeat is being shipped to Europe and Asia as you read this. A favorite claim of the horse slaughter industry was that they were "good for the local economy of the towns in which they exist", and that this local economy would be harmed if they should close. In the city of Kaufman, Texas, people living in a neighborhood near the Dallas Crown horse slaughter plant would beg to differ. While the Dallas Crown horse slaughter plant was in operation their daily life was spent dealing with the problems this plant burdened them with, such as blood backing up into their bathtubs due to the slaughterhouse overwhelming the city's sewer system, rat and vermin infestations, and the stench generated by the plant while it operated. Due to these, and numerous other health code violations the city of Kaufman responded by declaring the plant a nuisance and ordered them to close in 2006. As to economic benefit, the live horse industry contributes far more to the nation's economy than the horse slaughter industry. According to the 2005 American Horse Council (AHC) report the live horse industry contributes $39 billion in direct economic impacts to the US economy. The horse slaughter industry claims a paltry $40 million (roughly 1% of the live horse industry), however most of that profit is siphoned overseas to foreign stakeholders. As far as tax contributions go the live horse industry contributes $1.9 billion; while in comparison, the Dallas Crown Company paid a measly $5 in 2004. Another point is that for years our taxpayer dollars were spent to cover the expense to have a USDA inspector on site in these plants. That's right, our taxpayer dollars were spent to have the USDA inspect a product which is not even sold in our country. Congress voted to stop this in 2005, but due to the efforts of Rep Goodlatte and former Rep Bonilla, it did not go into effect until March of 2006. When confronted with the statistics and quotes showing that horse slaughter has nothing to do with horse welfare, the pro-slaughter side really cannot respond properly. They have a PR group which constantly repeats their claims, as if saying them loudly and repetitively enough times makes them somehow true. If that doesn't work it is not beneath them to try and fabricate a story to spread on the newswires, as they have been doing since 2007 in the form of bogus stories of abandoned horses running wild. It just shows the moral depths that they will sink to in an attempt to win. You may remember the spate of newspaper articles on the AP newswire last year claiming that there were abandoned horses running loose. One such article in The Oregonian newspaper quoted an Oregon law enforcement officer regarding nine new cases of abandonment; however when the group Veterinarians for Equine Welfare (VEW) contacted the officer the story he told was quite different than the claims made in the article. It was obvious that the story was a ruse. A similar story in Kentucky which appeared in Spring of 2007 was also exposed as a hoax. Because the pro-horse slaughter apologists have to fabricate stories to make their points, they have no credibility. In other words, I do not believe them when they say that this country needs horse slaughterhouses to "save" horses from neglect. It has been said that the history of the West was written from the saddle of a horse. Without horses, settlement of the West would have been all but impossible since a man on horseback could cover a much greater distance than one on foot. Without horses, wagons, stagecoaches and plows could not have been pulled. Today the horse still continues to be an important part of the American experience; we are thrilled by the prowess of a thoroughbred achieving a Kentucky Derby win, we are awed by the wild freedom of a herd of mustangs thundering across the open range, and we are entertained by horses in film and literature. To this day law enforcement still uses horses to help them with a broad range of duties from crowd control to search-and-rescue situations. Children with mental and physical disabilities have been offered unique support by learning new skills on horseback. Perhaps the best example of America's high regard for horses is Barbaro, the fallen Kentucky Derby winner whose story of hope and tragedy captivated our country. During his fight to recover, Barbaro received a huge outpouring of support from fans across the country. His story touched millions of people. Despite all this, there are people who claim that there is no difference between a horse and a cow. I'd ask these people to consider the Caisson Platoon. This unit of the US Army is in charge of all state funerals, which all former presidents are entitled to. In June of 2004 we saw the horse drawn caisson bearing the flag draped casket of former US President Ronald Reagan make its way along Constitution Avenue to the US Capitol. The caisson was followed by a riderless black horse tacked with an officer's English saddle with ammunition pouch, saber, bridle and riding boots facing backwards in the stirrups. These backwards-facing riding boots are meant to symbolize a fallen leader who will never again lead his troops into battle. To those who state that they don't see the difference between a horse and a cow, I offer up this question: Do you think Mr. Reagan's funeral procession would have had the same kind of dignity if the caisson had been drawn by cows and followed by a riderless pig? I do not think so myself, and I think the most of America would agree with me. The reality of it is this, the AHSPA enjoys wide ranging support in mainstream America as evidenced by the number of co-sponsors this bill has. If our Congress were given the opportunity to vote on this bill, it would pass by a landslide. We know that the horse slaughter industry has no correlation to unwanted horses or horse neglect. USDA statistics and statistics from representatives of the French horsemeat show that the slaughter industry is supplying an increasing overseas demand for horsemeat. We know that the ban on horse slaughter will not lead to a ban on beef, poultry and pork production. California, Texas and Illinois all have laws on the books banning the horsemeat industry and the people of those states can still go to their local butcher shop to buy tri-tip, pork roast and BBQ chicken. We know that in America, horses are not regulated as food animals and are routinely treated with products labeled "NOT FOR USE ON ANIMALS RAISED FOR FOOD." There are no safeguards to ensure that the meat from American horses is safe for human consumption. We know that the horse slaughter industry is not good for the local economy of the areas where they set up shop, just ask the people who reside in the Boggy Bottom area of Kaufman, Texas (the former home of the Dallas Crown horsemeat plant). This self-serving business siphons any profit it realizes overseas. We know that the pro-slaughter side will say and do anything to make their business look good. The "abandoned horse" stories which were shown to be false are evidence that their Public Relations group will stoop to manipulating the media. And finally - we know that the horse holds a special place in American culture. Polls show that a majority of Americans oppose horse slaughter taking place on American soil. The AHSPA enjoys strong support in the horse industry in the form of groups such as the Thoroughbred Racing Association and people like Gretchen Jackson, the owner and breeder of Barbaro. The horse slaughter business has never had, nor ever will have a place in the United States. To see a full list of AHSPA supporters, go here. There's an old saying that the truth shall set you free. Those of us who have been fighting and will continue to fight to get the AHSPA passed have no need to fabricate stories since the facts are clearly on our side. They do not lie and they cannot be disputed. As for the pro-slaughter side, they are likely to continue spouting their myths and rhetoric. But they never give a shred of proof to back their claims up, their tactic is to simply repeat their rhetoric as if repeating it enough times makes it somehow true. Our job is simple; to continue spreading the truth about horse slaughter. It is an unnecessary evil which has no place in the United States of America.